SAN CRISTOBAL, Venezuela -- Tebie Gonzalez and Ramiro Ramirez still have their sleek apartment, a fridge covered with souvenir magnets from vacations abroard, and closets full of name brand clothes. But they feel hunger drawing close. 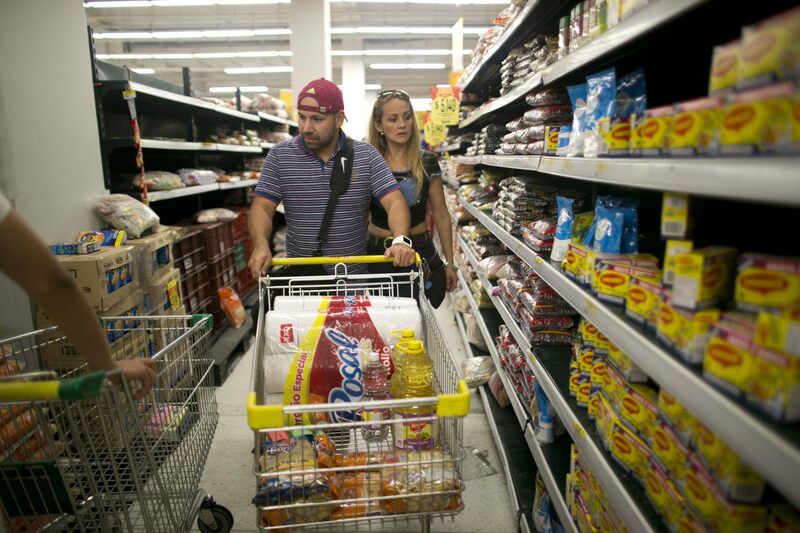 So when the Venezuelan government opened the long-closed border with Colombia this weekend, the couple decided to drain what remained of the savings they put away before the country spun into economic crisis and stocked up on food. They left their two young sons with relatives and joined more than 100,000 other Venezuelans trudging across what Colombian officials are calling a "humanitarian corridor" to buy as many basic goods as possible. "This is money we had been saving for an emergency, and this is an emergency," Ramirez said. "It's scary to spend it, but we're finding less food each day and we need to prepare for what's coming." Gonzalez, 36, earns several times the minimum wage with her job as a sales manager for a chain of furniture stores in the western mountain town of San Cristobal. But lately, her salary is no match for Venezuela's 700-percent inflation. Ramirez's auto parts shop went bust after President Nicolas Maduro closed the border with Colombia a year ago, citing uncontrolled smuggling, and cut off the region's best avenue for imported goods. The couple stopped eating out this year, abandoned plans to buy a house and put a "for sale" sign on their second car. There is no more sugar for coffee, no more butter for bread and no more infant formula for their 1-year-old son. When Ramirez, 37, went to get a late night snack on Friday, he found nothing in the refrigerator. So Sunday, the couple donned their nicest clothes and hid fat wads of bills in their bags. Before heading to the border, they surveyed the stocks in their renovated granite kitchen: An inch of vegetable oil at the bottom of a plastic jug. A single package of flour. Some leftover cooked rice. No coffee. Then they set off in a 2011 Jeep SUV onto darkened highways, the lights of hillside shantytowns glinting in the blue darkness like stars. At the crossing, scowling soldiers with automatic weapons patrolled a line that wrapped around more than a dozen blocks. The couple considered turning back. But within minutes, people started shouting that immigration officials were waving everyone through, and the line broke into a stampede. Gonzalez and Ramirez ran with thousands of others toward a bridge barely wide enough for two cars to pass. Soon, it was packed as tightly as a rush-hour subway train. Some people cradled newborns, others toted dogs as they headed to a new life in Colombia. Most carried suitcases and backpacks to fill with groceries. The couple held hands to stop the crowd from pushing them apart. Two hours passed. People sang the national anthem. Gonzalez's feet ached in Tommy Hilfiger wedge heels and they had barely reached the middle of the bridge. People who couldn't stand the claustrophobia and heat doubled back to try to swim across the river, but soldiers stopped them. At last, the Colombian flags came into view. Soon, the bridge opened out onto a road lined with officials waving, cheering, even doling out cake. No one checked ID cards. Beyond the reception line, music played and kiosks sold products that have become treasures in Venezuela: rice, toothpaste, detergent, and sacks of sugar. Gonzalez cried behind her oversized aviator glasses. "I thought the crossing would be easier. It made me feel so humiliated, like I was an animal; a refugee," she said. "But look how different things are on this side. It's like Disneyland," responded Ramirez. Not only was the town filled with prized groceries, but everything was much cheaper than on Venezuelan black market, now the only alternative for people who don't have time to spend in the hours-long lines for scarce goods that have become the most salient feature of the oil country's economic crisis. They changed their Venezuelan money into Colombian currency at a mall, where Gonzalez luxuriated in the clean, air-conditioned space as she window-shopped for watches and handbags. As she browsed past the shoes, a TV report flashed on the store television: It was an aerial shot of the bridge she had crossed over, crammed with people. "Humanitarian crisis," the headline said. "That isn't Venezuela. That isn't us," said a woman who was looking at sneakers. Gonzalez crossed herself and left. It was time to go food shopping and get home. The variety at the mall supermarket felt unreal after so many months of scrounging in near-empty stores. The couple debated over the best baby toothpaste. Gonzalez ran her hand over seven varieties of shampoo. She examined each option in an aisle of pasta. But while things were cheaper than in shortage-hit Venezuela, they were pricier than they had expected. They decided to skip the flour and sugar, instead choosing 10 packages of the cheapest pasta. They went for cloudy soy oil instead of the more expensive canola. Every price was checked and rechecked as the couple spent three hours deciding how to allocate their emergency fund. "It's more expensive than we had hoped, but what matters is that it's available at all," Ramirez said. Other Venezuelans in the store -- teachers, small business owners and office workers - pored over prices and reluctantly put things back. In the end, the couple bought enough food to fill two suitcases and a duffle bag, then slipped into the stream of exhausted shoppers filing back to Venezuela. It hasn't been announced if Maduro will lift the border closure again next weekend. Colombian soldiers shook hands with the departing Venezuelans. But the kindness didn't lift their spirits the same way it did when they entered Colombia hours earlier. At home, Ramirez and Gonzalez stacked their hard-won supplies into gleaming white pantry cabinets. They still looked pretty bare.